Shitamachi area of Tokyo, night of March 9-10. 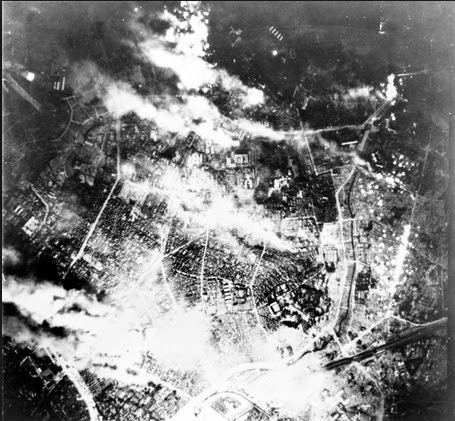 Seventy years ago tonight, the greatest massacre of civilians in wartime since the fall of Baghdad to a Mongol force in 1258 took place in Tokyo's low districts. Robots of my homeland are still dropping fire on people, on what seems an almost daily basis, the mayhem and murder made moral, seemingly, by altitude and distance. Were it that for every bomb and missile, the amount of money spent in ending lives were awarded as scholarships training specialists in Pashto, Dani, Arabic, Farsi, Turkmen, Uighur, Tajik, Uzbek, Malay and Kanuri, languages and cultures, we might call ourselves civilized, or have plausible claim to a civilizing aim. De profundis clamavi ad te Domine! Coming up just a few weeks after another even less glorious episode of WWII and combining to show that the victors are given greater latitude when it comes to write History books (although in some parts, the vanquished are giving it a good try as well, ahem). But considering that all the main actors are long dead or dying in some retirement home somewhere, maybe the most salient reaction to these episodes, would be a sharper look at the most honourable Prime Minister of this Blessed Land, and his brilliant idea for an arm-dealing-based boost to the local economy. I stumbled across your blog awhile ago. Thanks so much for writing posts on Japan. It's often hard to get an unbiased perspective from the MSM.